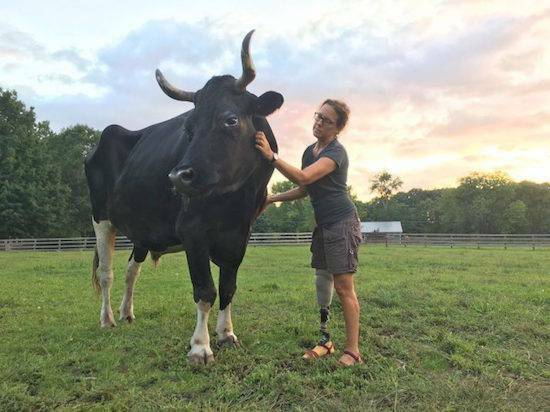 We are so happy that Andy was able to live a full, happy life, where there was never a threat that he would become veal, hamburger or steak—as is the fate of the 39 million cows and calves who are slaughtered for food annually in the U.S. He lived a life that was one in a billion. At the end of August, 2016, we said a tearful goodbye to Andy the steer. 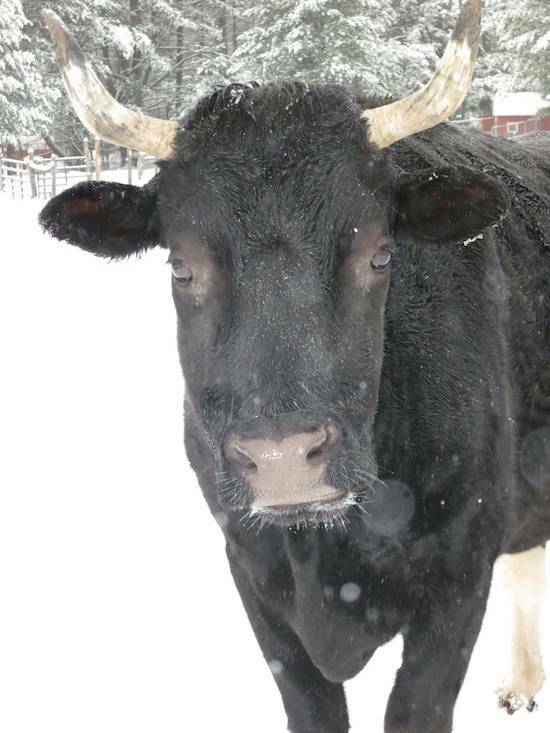 He and his herdmates, Elvis and Ralphie, arrived together as our very first four-legged residents back in 2004. They were rescued by friend and founding supporter Libra Max, from a dark, dismal dairy farm where they would have slaughtered for veal. 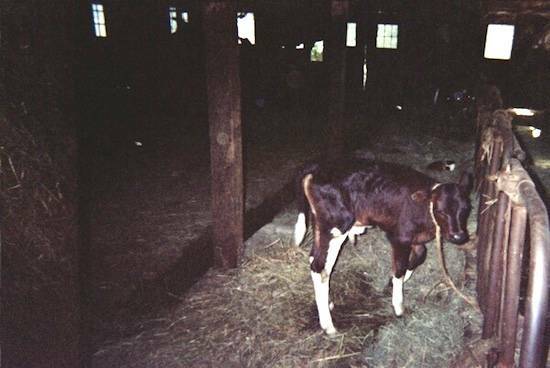 Libra was looking for the home of a cat she found in the neighborhood when she stumbled upon the calves. 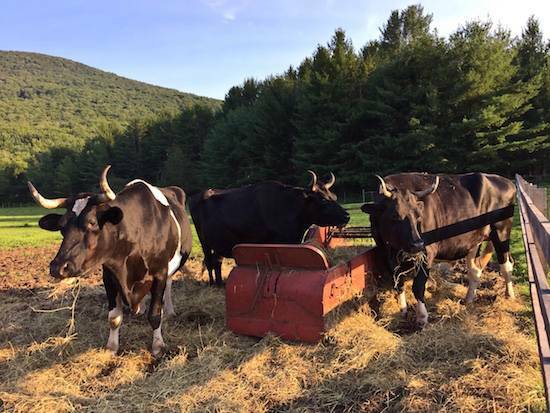 They spent about 20 months at various foster homes before arriving at their permanent pasture with Woodstock Sanctuary. For over a decade Andy, a very gentle giant, would saunter up to tour groups with (mutual) curiosity, teaching countless thousands about the plight of male calves in the dairy industry. He was the perfect ambassador to show how personable and affectionate cows can be. 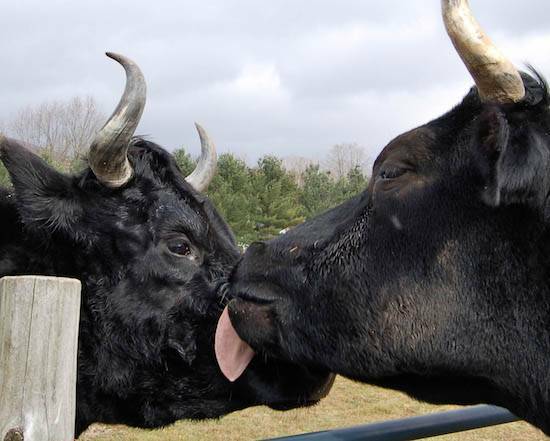 It’s really only in a sanctuary environment that one gets to see what good and true friends cows can be with each other; when Ralphie was recovering from an extended stint at the vet hospital, Andy leaned over a gate and licked Ralphie all over his face and chest to welcome him back. Andy bestows a recovering Ralphie with kisses. Photo by Bob Esposito. Andy was a handsome Holstein steer — all black except for his white “boots.” (Holsteins are the most common breed used for dairy in the U.S., and typically have black and white markings.) His big, soulful brown eyes and gentle demeanor were some of his best features, although he had many. He would kindly accept cuddles and scratches, which were even better when served with green apples or carrots. In his last few weeks, Andy’s 2,000-plus pounds became too much to bear because of the progressing arthritis in his back legs. Unbearable as it was, we all knew it was time to let him go. The whole staff and regular volunteers made sure to give him even more love than usual. 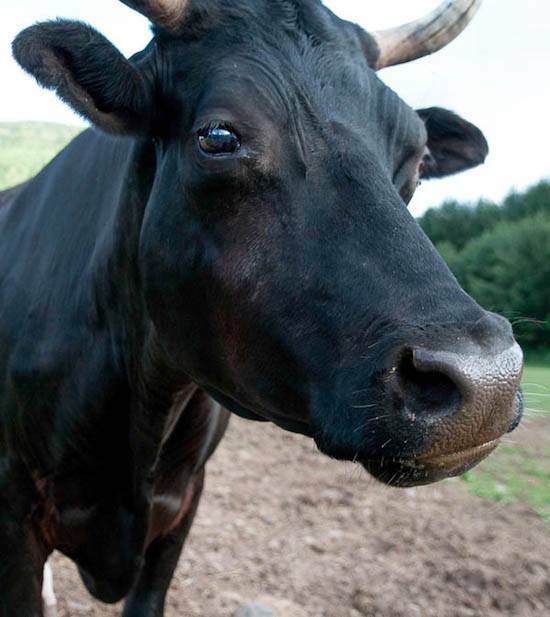 While its hard to imagine the trio of Andy, Ralphie and Elvis without him, we are so happy that he was able to live a full, happy life, where there was never a threat that he would become veal, hamburger or steak—as is the fate of the 39 million cows and calves who are slaughtered for food annually in the U.S. He lived a life that was one in a billion. We are eternally grateful for the gifts Andy bestowed upon so many. He will live on in your hearts forever.